Climate is a pervasive factor in nearly all forms of agriculture  from determining the geographical area in which a given crop can be grown, to influencing annual yields and the quality of the crop. With such strong ties to agriculture, climate also influences cultural issues, such as economics, regional identities, and migration and settlement. These connections are never more evident than with the growing of grapes and the production of wine. The grapevine is one of the oldest cultivated plants that, along with the process of making wine, has resulted in a rich geographical and cultural history. The cultivation of grapevines (viticulture) predates written history. Grapevines are projected to grow better in warmer climates, and new regions may open up to viticulture. But changing climates have the potential to bring about increased challenges for wine-grape growers, both in the vineyard and the winery. All images courtesy of Gregory Jones. Archaeological findings in the Caucasian Mountains, near the town of Shiraz in ancient Persia, indicate that viticulture existed as far back as 3500 B.C. Vitis vinifera (the wine-grape bearing vine and one of about 60 species of the Vitis genus that is principally used for winemaking) was first domesticated in this region and soon spread to Assyria, Babylon and the shores of the Black Sea. The Assyrians brought the art and knowledge of winemaking to Palestine and Egypt, and from there, the Phoenicians carried the vine and its secrets around the Mediterranean and east toward Morocco and Portugal. The Greeks and Romans learned the trade from the Phoenicians and proceeded to spread their knowledge of wine throughout Europe. Ultimately, the Romans were responsible for the first vineyard plantings in most of todays renowned viticulture regions in the Mediterranean Basin. They cultivated the grapevine in Bordeaux, the French valleys of the Rhône, Marne and Seine rivers, in Germany along the Mosel and Rhine rivers, and even in the British Isles. During the Dark Ages, grape growing declined throughout most of Europe. Viticulture would have died out during this period had it not been for the Christian monks who preserved the methods of viticulture and made vast improvements in cellaring techniques. From the 10th through the 13th centuries, the monasteries controlled the growing of grapes and the trading of wine. After the 15th century, viticulture once again spread throughout Europe and enjoyed a renewed growth in popularity. European explorers then carried the vine with them to their new colonies and helped establish the industry in New World regions that were well-suited for cultivation. From this long history of development has come a distinct regionalization of both the grape varieties grown and the wine styles produced. This regionalization is intimately tied to both the landscapes and climates of these areas and has become synonymous with the French term terroir (see story). While not directly translatable into English, the term has come to embody both the physical environment and cultural interactions that together produce a specific wine style and its quality characteristics. Although it is debatable which terroir component is most important  landscape, soil, climate or cultural practices  climate clearly determines whether a region can adequately ripen the fruit to produce high-quality wines. History has shown that wine-grape-growing regions developed when and where the climate was most conducive. For example during the medieval Little Optimum period (roughly A.D. 900 to 1300), temperatures were up to 1 degree Celsius warmer, allowing the planting of vineyards as far north as the coastal zones of the Baltic Sea and southern England. Conversely, temperature declines during the 14th century were dramatic, leading to the Little Ice Age (extending into the late 19th century), and resulted in northern vineyards dying out and growing seasons so short that harvesting grapes in southern Europe was difficult. In general, the overall wine style that a region produces is a result of the baseline climate, whereas climate variability determines vintage quality differences. Todays viticultural regions for quality wine production are located in narrow climatic zones that put them at particular risk from both short-term climate variability and long-term climate change. Therefore, climatic changes have the potential to bring about changes in wine styles or regional viability altogether. Our understanding of climate change and the potential impacts on viticulture and viniculture (the science of making wines) has become increasingly important as changing levels of greenhouse gases and alterations in earth-surface characteristics bring about changes in Earths radiation budget, global temperatures, atmospheric circulation and the hydrologic cycle. In the wine world, it has become commonplace to hear that the (insert your favorite year) was the vintage of the century, as it has become increasingly easier to produce quality wines. Have these changes come about through better grape-growing practices, better plant material, better winemaking techniques or more beneficial climates? While it is clear that advances in both viticulture and viniculture have provided the tools to produce better wines, climate is the wild card that limits the geographical distribution of grape growing and determines yield and quality differences between years and regions. Although many have reasoned over the years that climate change may play an important role in wine quality, Janice Lough and colleagues in 1983 were among the first research groups to recognize the growing importance of climate change to the industry, in an article published in the Journal of Climate and Applied Meteorology. The authors showed that with warming climates, the growing seasons in Europe should lengthen, and that wine quality in Champagne and Bordeaux should increase. Today, we know that their results were largely correct, as the last 10 to 15 years have provided a wonderful string of vintages throughout much of Europe and the New World. Numerous other studies suggest that climate change may impact grape growing and wine production. The potential impacts include changes in the geographical distribution of viable grape-growing areas due to changes in temperature and precipitation, greater pest and disease pressure due to milder winters, changes in sea level (which could potentially alter the coastal zone influences on viticultural climates), and the effect on vine growth and grape quality from increases in carbon dioxide. Until now, however, researchers had not conducted a global analysis of the impacts of climate change on wine quality. Thus, my colleagues and I set out to examine the observed changes seen in growing-season temperatures and to link the variations to trends in vintage ratings (a common measure by which vintages are compared). Using a general circulation model for 27 of arguably the worlds finest wine regions, we were also able to project growing-season temperature changes. Growing-season temperatures are a measure of the ripening potential for grape varieties grown in climates that range from cool to hot. For example, Pinot Noir grapes are grown in regions that have mostly cool climates, with growing-season temperatures that range from roughly 14 to 16 degrees Celsius (for example, Champagne, Burgundy and Northern Oregon), while Cabernet Sauvignon grapes are grown in regions that span from warm to hot climates, with growing season temperatures that range from roughly 16.5 to 19.5 degrees Celsius (for example, Bordeaux or Napa). 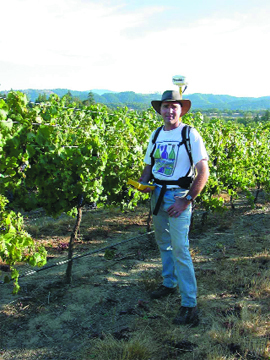 Climatologist Gregory Jones uses GPS to fix the coordinates of a vineyard for further analysis. Research is showing a correlation between changes in climate and wine-grape quality. Our results show that from 1950 to 1999, the majority of the worlds high-quality wine-producing regions saw growing-season warming that averaged 1.26 degrees Celsius. The warming has coincided with a general increase in vintage ratings over the last 20 to 40 years in these same regions. Although the strength of the climate-ratings relationships varies by region, a 1-degree-Celsius warming results in a 13-point increase in the ratings on average (on a 100-point scale). Cooler climate regions, such as the Mosel and Rhine valleys of Germany, appear to have garnered the most benefit. At issue, however, is that many of these regions are either at or nearing their optimum climates for the varieties grown and wine styles produced. Wine-quality impacts from climate change are evidenced mostly through more rapid plant growth and out-of-balance ripening profiles. A ripening period that allows sugars to accumulate, maintains acid levels and produces the optimum flavor profile for that variety will result in a balanced wine. In a warmer-than-ideal environment, the grapevine will go through its phenological events (the combination of biological events with climate) more rapidly, resulting in earlier sugar ripeness. While the grower or winemaker is waiting for flavors to develop, the acidity is lost through respiration, resulting in flabby wines (high alcohol with little acidity retained for freshness). In addition, harvests that occur in a warmer part of the growing season  for example, August or September instead of October in the Northern Hemisphere  will result in hot and potentially desiccated fruit without greater irrigation inputs. To examine future climates in the same wine regions, our study analyzed output from a general circulation model from 1950 to 2049. A comparison of two periods, 1950 to 1999 and 2000 to 2049, suggests that mean growing-season temperatures will warm by an average 1.24 degrees Celsius over the wine regions studied. The magnitude of these mean growing-season changes indicate potential shifts in the relationship between climate and wine varieties for many regions at or near a given threshold of ripening potential for varieties currently grown. The projected changes are greater for the Northern Hemisphere than the Southern Hemisphere. And the growing-season temperatures projected for 2000 to 2049 also reveal significant changes in each wine region, with trends ranging from 0.18 degrees Celsius to 0.58 degrees Celsius per decade. Overall trends during the time period average more than 2 degrees Celsius across all regions, with the smallest warming in South Africa and greatest warming in Portugal. Our analysis reveals that the impacts of climate change are not likely to be uniform across all varieties and regions, but are more likely to be related to a climatic threshold whereby any continued warming would push a region outside the ability to ripen varieties that are already established. Cooler climate regions have a greater ability to adapt to climate change, as they would be climatically more conducive to ripening than some warmer climate varieties. If a region, however, is already in a hot climate and warms beyond what is considered viable for even the greatest heat-requiring varieties, then grape growing becomes challenging and maybe even impossible. The observed warming of the past 50 years appears to have mostly benefited the quality of wine grown worldwide. However, the average predicted warming in the next 50 years has numerous potential impacts on the wine industry  including changes in grapevine phenological timing, disruption of balanced composition in grapes and wine, alterations in varieties grown and regional wine styles, and spatial changes in viable grape-growing regions. Potentially even more important is that climate change, through its direct impact on grape and wine production, has the ability to indirectly bring about cultural change by altering long-held regional identities. The wine industry likely can adapt to the possible changes in climate, but not without help. Today many of the Old World wine regions in Europe have stringent standards by which varieties, yields, growing and winemaking techniques, and wine styles are regulated to assure quality and maintain identities. For example, the summer heat wave of 2003 in Europe produced very early harvests and some challenging growing conditions that without irrigation (largely outlawed in Europe) resulted in lower yields and out-of-balance flavors. Although New World wine regions have fewer governmental constraints, growers and winemakers worldwide will need the freedom to adapt to the potential changes in climate in both the short and long term. Perhaps a sign of things to come is being seen across Britain, where the past decade or so has provided growing conditions not seen since the 13th century, and grapes have ripened and produced drinkable wine. In the April 25, 2004, London Times, John Walples and John Elliot report that a venture between winemakers from Champagne in France and Kent and Sussex in England will result in the first collaboration between the two regions. Perhaps the French have seen one of the potential changes brought about by climate change  shifts in viable areas  and are hedging their bets. This would appear to be the case in at least one instance: A June 2, 2004, BBC story reports that English sparkling wines either beat out or equaled Champagnes in a recent taste test (see sidebar). While the exact magnitude and rate of climate change in the future is unknown, history has shown that climate and wine are intricately linked. However, predicting future wine quality is also inexact. The question may be whether wine lovers should buy a favorite wine from a favorite region to hold onto, just in case, or whether they should appreciate change and simply enjoy the potential range of new regions and new wines borne from a different climate. The pop of corks may one day replace soccer as the favorite cross-channel rivalry between France and England. English wines, particularly sparkling wines, are beginning to challenge Frances dominance in the Champagne and wine market  a trend some scientists say is linked to climate change. In a blind taste test, recently conducted by Which? magazine in London, several English sparkling wines scored higher than the more popular (and pricey) French Champagnes. Although English non-sparkling wines did not fare as well in the survey, a string of warm, dry summers and similar forecasts for the future has vineyard owners more optimistic than ever. Last year was genuinely sensational, the amount of sunshine and warmth has picked up in the last five years, and its been at least 15 years since something severe, like a late frost, has happened, says Frazer Thompson, managing director of English Wines Group, producers of Chapel Down sparkling wine. For winemakers, better weather translates into a superior grape harvest with a more favorable balance of sugars and acids. The conditions for viticulture have not been this good since the Medieval Warm Period, more than 700 years ago, says Richard Selley, a geologist at the Imperial College London. Following the warm phase, Europe plunged into the Little Ice Age and remained largely vineyard-free until after World War II, Selley says. Since then, grape production and quality have slowly increased throughout the world, which correlates to an increase in temperature over the last 50 years, reports Southern Oregon Universitys Gregory Jones and others in a presentation at the Geological Society of Americas 2003 annual meeting in Seattle last fall. Today, there are close to 400 wineries in England and Wales, with more likely on the way. In addition to increasing temperatures, the geology of southern England is favorable to viticulture. The geology of the British Isles is roughly comparable to the European mainland, Selley says. But what everyone is interested in is the chalk, the Cretaceous limestone, because that is what Champagne is grown on. Selley adds that French Champagne growers have recently looked into the possibility of buying up land in southern England that has this chalky soil. If the warming trend continues, as Jones and his colleagues have predicted, marginal may no longer apply to the English vineyards. Winemakers in southern England have more than climate and geology to depend on though. Were also next door to London, with the highest concentration of Champagne drinkers in the world, says Thompson, with a little British pride. Visit Geomedia online for a review of The Winelands of Britain: Past, Present, and Prospective. Jones is a climatologist and associate professor in the Geography Department at Southern Oregon University. He has published many articles in the areas of climate variability and change and has also presented research at more than 50 regional, national and international conferences on climate-related issues. His family also has a vineyard and winery in the Umpqua Valley of Oregon. E-mail: gjones@sou.edu. Gladstones, J., Viticulture and Environment. Winetitles, Adelaide, 1992. Jones, G. V., White, M. A., and Cooper, O. R., 2004, Climate change and global wine quality. Climatic Change. (Submitted winter 2004: in review). Stevenson, T., New Sothebys Wine Encyclopedia: A Comprehensive Reference Guide to the Wines of the World, 3rd ed., Dorling Kindersley, London, 2001.